"I found I could say things with colour & shapes that I couldn't say any other way - things I had no words for"
This one bedroom flat in the prime location of Park Circus, Glasgow, started off as a completely blank canvas as the high spec renovation had the classic white wall finish. The owners love bold colours and had an extensive art collection to reflect this, so by using a bold colour scheme we united all the rooms in the flat. 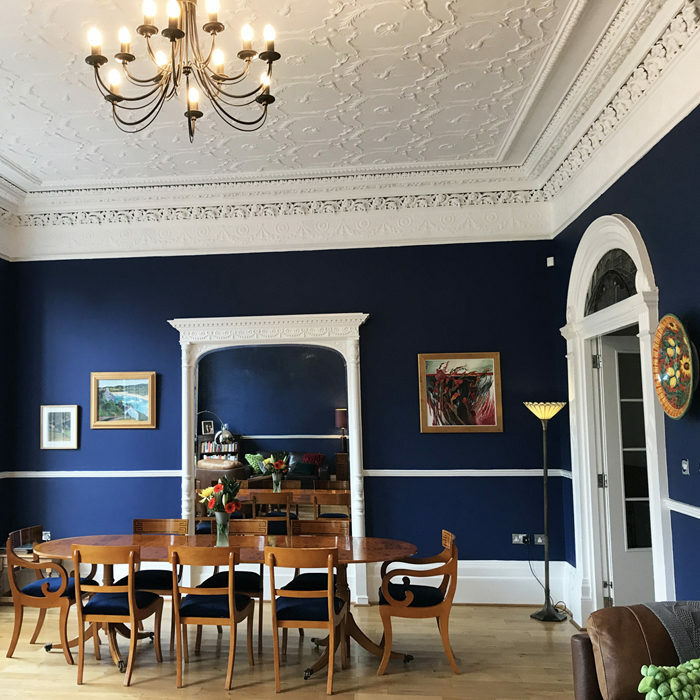 The large living room and dining room area was treated with a rich period blue on the walls, enhancing period features and the ornate plaster ceiling. Colourful lamps and texturised soft furnishing all tied the look together to create an eye catching room that really gives them the wow factor. The hallway was painted in a light grey and leads through to a newly painted kitchen in deep green, making the rich wooden floor and kitchen slash back pop out and warm the room. Finally you are taken through to the master bedroom which was warmed by using a pop of purple on the walls, and the feature teal colour appears on new bedside lights, and hand painted up-cycled bedside cabinets. Bold colours are the backdrop for each living space, creating rooms with their own distinct personalities. The living & dining room is a deep blue, creating a cosy space that really is perfect for relaxing in of an evening. A mix of vintage touches in furniture and accessories, pepper the space adding a little warmth, along with the brass metal highlights throughout. Handmade curtains in a graphic modern print lift the room and break up the block colour. Accent greys from the living room link through to the hallway, kitchen and second bedroom, only to be lifted by a pop of bold yellow making a really fun and modern colour scheme. Finally the master bedroom was to be a space where we can really relax. 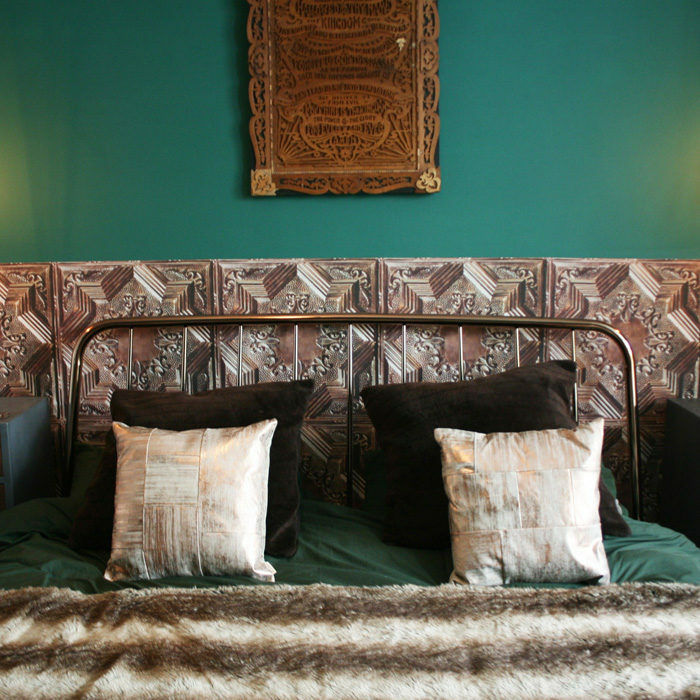 The deep green creates a darker space, that is lifted by copper metal accent details. Mixes of texture and pattern sit comfortably against vintage touches and hand made bold fern print curtains help bring the outside garden in to soften the dark green walls. 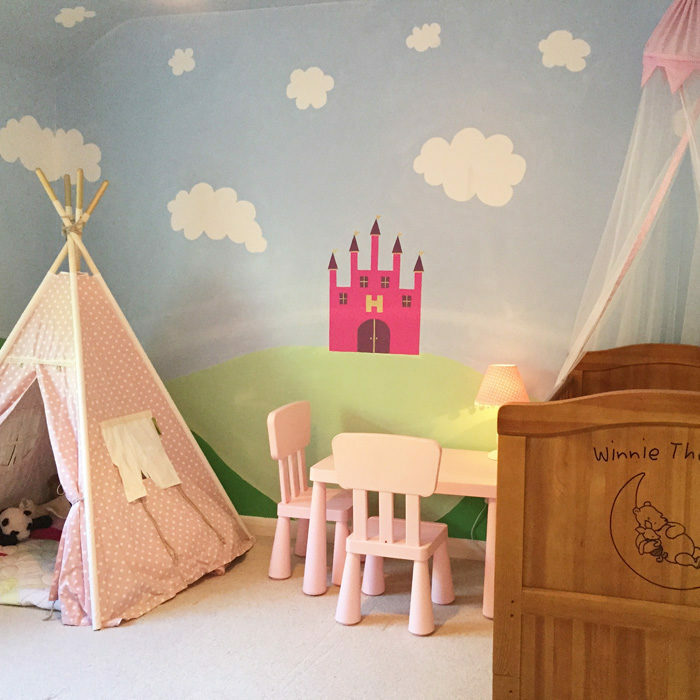 Holly, like many little girls, loves pink and asked for a princess bedroom. Taking some of her favourite features I designed for her nursery, I added to them to make room that was truly unique for her. The walls were painted to create green hills with a bright blue cloudy sky. This also sets the backdrop for a hand painted pink princess castle that Holly can use in her play. Pink furniture fills the room, and a gold frame hangs on the wall framing a large fabric letter H.
Finally a powder pink tee-pee was made to sit in the corner, so Holly had her very own secret castle to play in with her toys. A room truly fit for a princess! 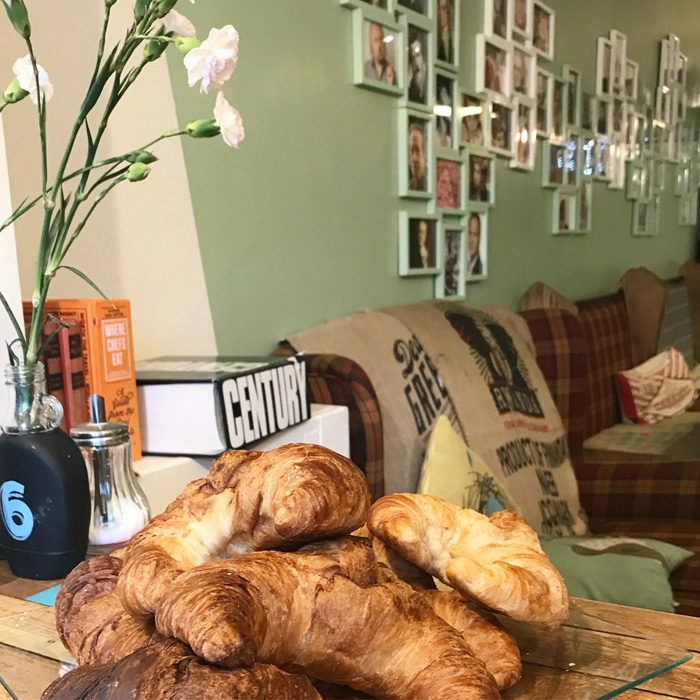 William Cafe's design scheme was built around their new graphic branding, using the colours from their logo; light blue, light green and cream - taken from the cafe's favourite crockery set. The interior was zoned using newly painted walls. Blue was used to define the work and kitchen area, green for the eating area, and cream for the entrance. As the cafe is known for its quirky banter, the zones were painted with sharp diagonal edges. A bespoke wall of famous Williams was created as a fun focal point for customers and I hand painted two large chalk board menus which hang on the walls. New menus were designed, printed on kraft paper and put on wooden clipboards. Tables were finished off with hand painted chalk board vases made of recycled maple syrup jars. Recycled Dear Green coffee bags cover sofas and some chairs were upholstered with them, to add to the rustic feel. Holly's nursery started off as a small cream box room. Not to overpower the space with too much colour, the design was arranged to have hints of bright colour and also points of interest that Holly could grow up noticing and enjoying. There were two focal points, firstly the ceiling was painted to look like a blue sky with white fluffy clouds - something that Holly would stare at regularly with curiosity. Secondly I created a tree with bright flowers growing out of the wooden chest of drawers. This also had small hooks in it so Holly's favourite outfits could be hung on the wall. Small colourful animals could be found in unusual places around the room so Holly could slowly discover them as she grew up. Then book shelves were hung on the wall to look like floating clouds. 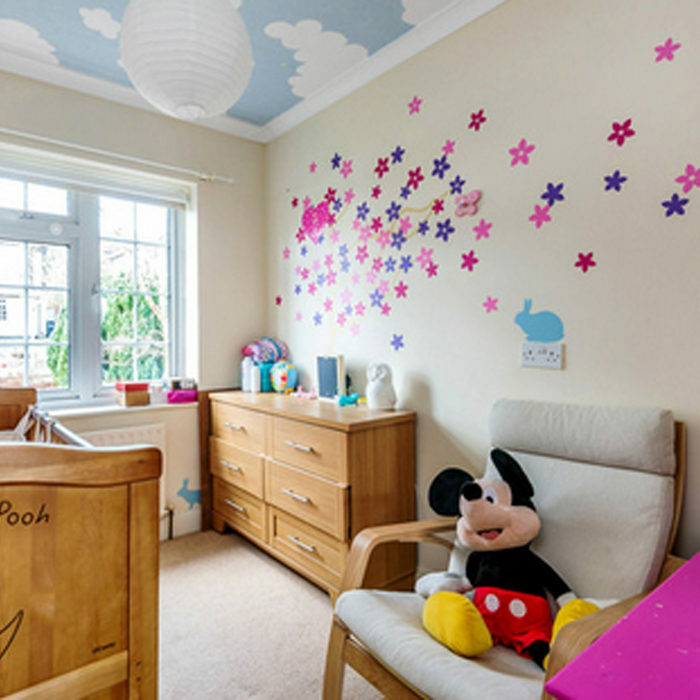 This nursery had to be designed in a gender neutral colour scheme as the parents didn't want to know if they were having a boy or girl. Keeping the colour scheme neutral we decided on white, with pops of gold throughout. 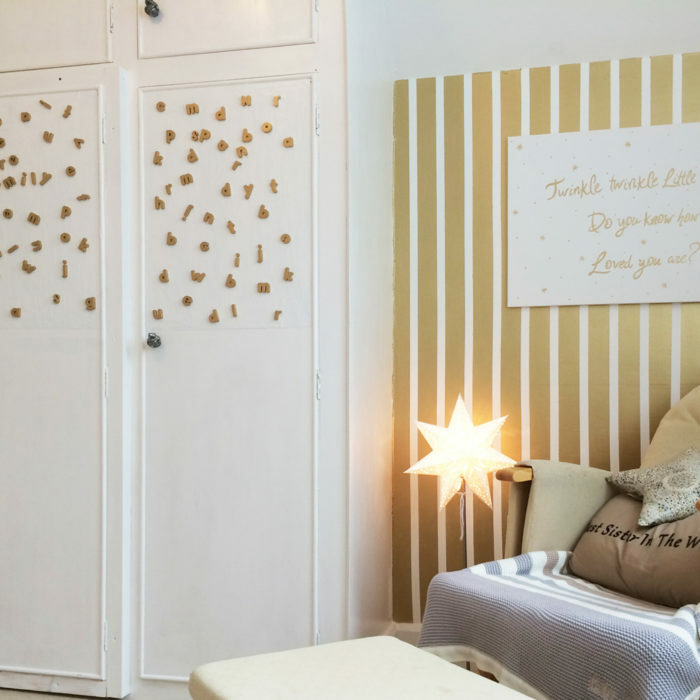 I painted one feature wall with gold stripes, and created bespoke canvas art work to hang on the wall, including a full alphabet of mini canvases with animals drawn on them. Texture was added to the room with a cream sheepskin rug, double layer curtains, and a bespoke star cushion to sit on the nursing chair which had been handed down in the family. The star motive was continued with tiny gold stars above the cot, a star mobile, and a star night light suitable for night time feeds. Finally to make a feature of the existing built in cupboards I painted them with magnetic paint and hand painted magnetic alphabet letters so the parents could have some fun with Holly when she started learning letters. This was my second flat in London, which started off as a run down one bed garden flat. We rebuilt the entire flat including adding an extension on the rear of the property, and changing the internal layout to two double bedrooms. The back of the flat was opened up into an open plan living room and kitchen, opening straight out onto the garden. Then finally a bespoke garden office was constructed at the bottom of the garden space to create a cozy office. A labour of love, most of the work was done ourselves, with the exception of project managing some of the larger builds required. For a lower ground floor flat, the goal was to bring in as much light as possible and create a mini haven which cleverly made the most of the space it had. This nursery really was one of the smallest rooms I have worked on. It was so important to make the most of the space and ensure it was cleverly maximising storage wherever possible. The room had recently been decorated and the wallpaper was to stay, so I had to design the scheme around it. 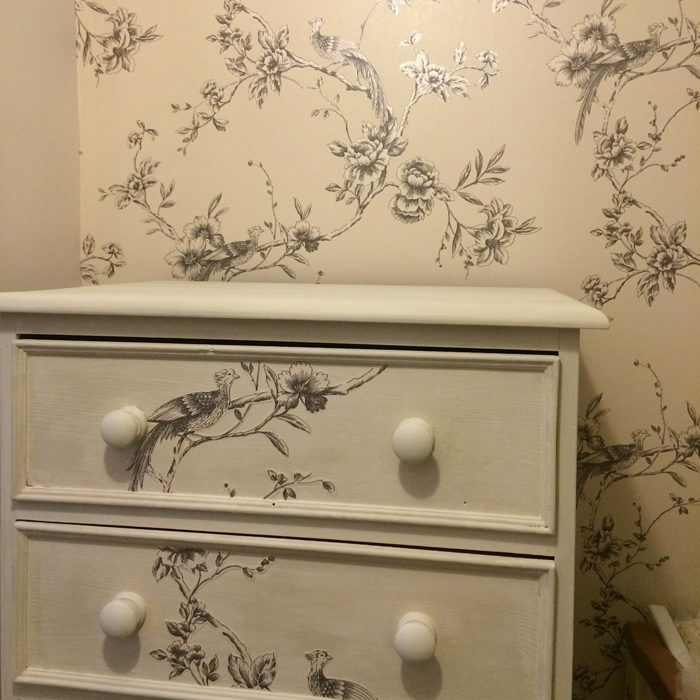 I up-cycled a tall boy unit that had been passed down in the family, painting it a light cream, then decoupaging sections of the wallpaper along the front. This made it sit beautifully against the wall and gave the illusion of not taking up so much space. I used storage under the cot, a slim DVD cabinet as shelving, and even spice racks as clever book shelves. Finally I added two hand made items to make the room really bespoke. The first were hand dyed canvas bags with a feather embellishment that could be used as extra storage on the back of the door. The second was a hand made mobile to hang over the cot. Mirroring the bird theme from the wallpaper, I used twigs wrapped in string, and balanced small patchwork birds on the edges. 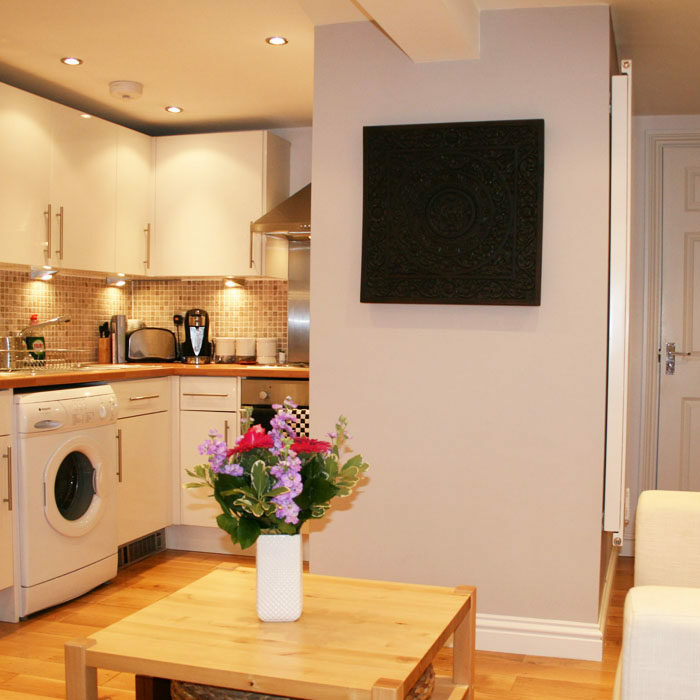 This was my first ever property in London - a small studio basement flat. With a space this small, storage was the most important factor of the design. The colour scheme had to be neutral to maximise on the small amount of light that came in through the glass front door and one other tiny window. The kitchen doubled as storage cupboards for other items and was kept white, with a cream marble tile backsplash. The wooden worktop added some warmth and matched the wooden flooring throughout the room. One small section of the wall was painted taupe to add a feature and frame artwork. 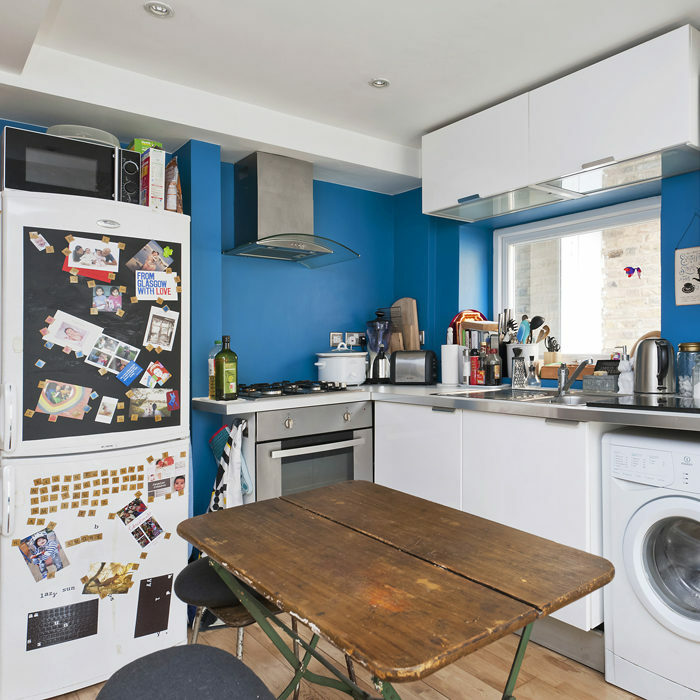 The colour palette continued through to the bathroom to give the illusion of more space, then finally a boiler cupboard off the bathroom at the back of the flat was reformatted to become a walk in wardrobe to keep the bulk of the storage items out of the main living space.